Welcome to language-easy.org! Well, as you have clicked on this site, I suppose that you want to enter the real depth of German grammar. So, in this case, we will talk about German personal pronouns. Unfortunately, this kind of pronouns can be rather complicated sometimes. But, let’s be honest, there are not too much topics in German grammar which are really easy. Luckily, German personal pronouns are of essential importance in the German language. And, well, this should also serve you as motivation! 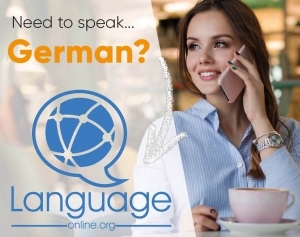 So, once you master this topic, you will be able to improve you spoken and written German significantly. Furthermore, it allows you to understand grammar construction. Well, as already mentioned, they are really essential! Nevertheless, there is a lot of practice needed and, of course, you will still fail a lot especially in the way you use German personal pronouns in the correct kind of way. But, I am convinced that you are a smart person and this topic won’t be too complicated for! So, let’s go straight ahead and talk about the importance of German personal pronouns in the German language. What are German Personal Pronouns? Was sind Personalpronomen im Deutschen? First of all, we should clear up what we are actually talking about! So, German personal pronouns replace nouns which have already been mentioned before. Unfortunately, German personal pronouns are declined. Of course, this means that their endings change! Logically, this depends on the case they are in. Well, nominative, accusative and dative in this case. By the way, genitive is not mentioned here, as in this case we talk about German possessive pronouns. So, we use German personal pronouns to talk about ourselves and to address other people. 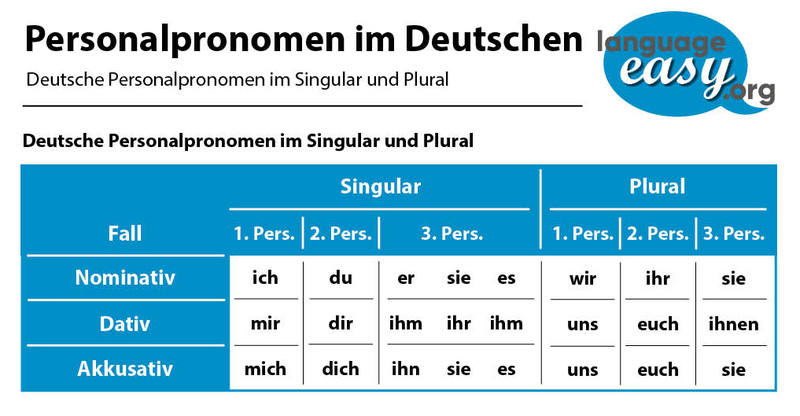 In the following, I’d like to show you two table that will you you German personal pronouns in singular and plural. So, let’s not loose too much time and have a look at the tables! Well, I think that most of you have already heard or seen these forms. Nevertheless, it is really important to know what and why you are using these kind of German pronouns. Now, let’s come to the plural forms. Of course, forms differ depending on number of the noun they replace. Furthermore, they can also reflect the gender! In the following, we will have a look the usage of German personal pronouns. Now, we have reached the most important part of this article – the usage of German personal pronouns. So, as I have already mentioned, German personal pronouns are declined depending on their number, case and gender. In the following, we will have a look at some examples that will show us the correct usage of this kind of pronouns in different situations. 1. First, we use personal pronouns in the the 3rd person singular to replace a noun that was already mentioned before. Well, in case of doubt, just repeat the noun, in order to avoid confusing situations. “Philip hatte einen Hund. Er ist gestorben.” – Philip had a dog. He died. 2. Second, you should use pronouns in third person singular neuter in impersonal forms. “Es regnet sehr große Tropfen.” – Very big rain drops are falling. 3. Third, you can use “es” as a placeholder for an entire clause that comes later in the sentence. “Schwimmen ist ein toller Sport. Es wir hier oft praktiziert.” – Swimming is a great sport. We practice it a lot. 4. Fourth, you can use German personal pronouns in the first person to talk about ourselves. Actually, you can use it in singular and plural. 5. Fifth and last,you should use German personal pronouns in the 2nd person or the polite form “Sie” to address other people. By the way, “Sie” is equal to the third person singular. “Können Sie das wiederholen? Ich kann Ihnen nicht folgen.” – Can you repeat that? I can’t follow you. Hopefully, you have learned some new things about German personal pronouns. So, especially about their different forms and, of course, the correct way to use them. Unfortunately, there are a lot of exceptions and additional meanings. Well, that’s something typical of German – you simply have to study, study, study. But try to think in possibilities German opens you: The country, the people and their culture. By the way, there is a good article on Wikipedia about German verbs and also there are some list of irregular ones.